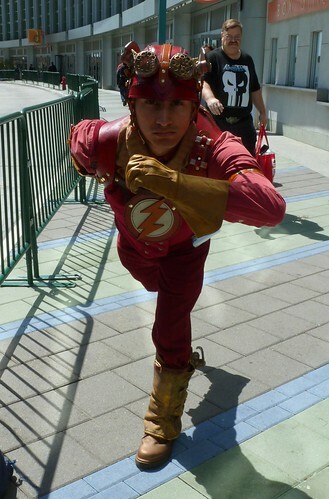 Steampunk Flash. We actually did a feature about his costume last year by the costumers who made it. We brought our son along (it was his first comic-con). Having a toddler with you really changes what you can do, how you get around, how quickly you can get around, etc. He had a great time looking at people and displays, and playing with demo toys. I forgot to drink water and ended up thoroughly exhausted and dehydrated after only four hours at the con. Seriously: Drink water. Especially if you end up eating salty food because it’s what’s available and you can eat it fast. You’re walking around for hours, and if you’re spending multiple days at a con, you can wear yourself out easily. That’s especially bad if you have a long drive home at the end. This entry was posted in Fandom and tagged Cosplay, Steampunk, WonderCon, WonderCon 2012 on March 19, 2012 by Kelson. Are there water fountains at that venue? I always try to drink a lot during a con, but that’s because I have a dry mouth and a few health issues. Sometimes I bring a water bottle with me, but carrying it for a while wears me down. Get a water bottle holder…either for a belt or as a shoulder loop. You can usually find them in sporting goods stores. I use a quality steel bottle because plastic…not good. Nor is drinking from public venues because usually the city treats the water with chemicals…but even that is better than nothing. If you get really dehydrated, try taking a teaspoon of vegetable oil with your water. The oil helps your body to hold the water in your cells rather than having it immedidately pass right through. Coconut oil is best as it has lots of healing elements as well. I loved that steampunk Flash outfit then and even more so now. Piece of art, that. Gotta get to work, but…Geek Gasp! Tribble Classic Trek uniforms! Love the photos! Good tips that I should probably add to my Convention Tips list. In this case I literally forgot. I carried a bottle of water around all three days, but somehow didn’t drink any of it on Sunday. OH. You guys did the article? You should have told me that, I would have been more down for talkies. There were so many people at the con that inquired about it. Now I’m kicking myself for not saying more. You seemed like you were in a hurry (pun not intended) to get on the shuttle, so I didn’t want to keep you. Sorry!